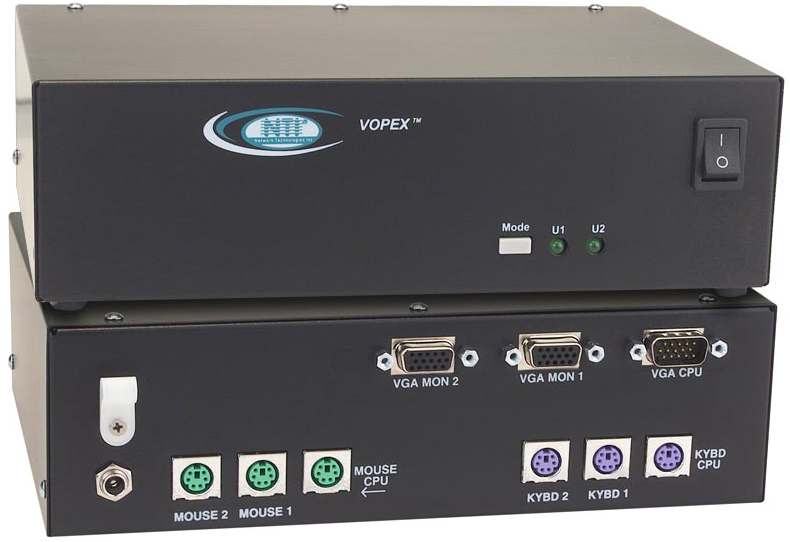 The VOPEX® KVM splitter with optional audio allows up to four users to share the use of one PS/2 computer. 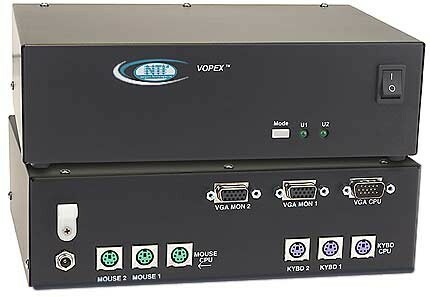 The VOPEX® VGA PS/2 KVM splitter allows up to four users to share the use of one PS/2 computer. Access one computer from multiple locations. Multiple users can enter data into the same program. Interconnect NTI switches and splitters for complex applications. Allows access to a PC from inside and outside of a clean room. Compatible with PS/2 style PCs, RS6000, SGI, and HP9000. Female 15-pin HD connectors for VGA monitor. Keyboards and mice are hot-pluggable. One 3-ft male-to-female VGA cable and two 6-ft male-to-male PS/2 cables are provided to connect your PS/2 keyboard, mouse and video ports. Use VKMEXT 3-in-1 cable to extend keyboard, monitor and mouse to 100 feet (30 meters). Press MODE button to cycle through all 6 modes. LEDs indicate which mode is selected. USER 1 Mode – Only USER 1 can type or move the mouse. USER 2 Mode – Only USER 2 can type or move the mouse. USER 3 Mode – Only USER 3 can type or move the mouse. USER 4 Mode – Only USER 4 can type or move the mouse. INST Mode – All user(s) have immediate access after last keystroke or mouse movement occurs on active user. DELAY Mode – Locked out user(s) must wait five seconds after last keystroke or mouse movement occurs on active user. In Inst or Delay Mode, typing or mouse movement activates user control. A network manager can access multiple computers, while each user has individual access to their own computer. Interconnect the VOPEX® KVM Splitter, VOPEX-xKVIM-A, with XTENDEX™ KVM Extenders via CAT5, ST-C5KVM-600 to access one PC from multiple control locations located up to 600 feet away using CAT5 UTP cable. "Thank you for filling a niche at an affordable price. Your KVM Splitter (VOPEX-4KVIM-A) was just what I was looking for- it is a great way to quickly and painlessly share a PC." "The VOPEX-4KVIM-A 4-port KVM splitter worked great and did exactly what we needed with perfect resolution." "I just wanted to let you know how pleased I am with your VOPEX-4KVIM-A 4-Port KVM Splitter. We have had it in service for almost two years and have had no problems. It works as advertised and is very reliable. Thanks for a great product." "I want to thank you for sending my order so quickly. I have two dental operatories, which are connected to one CPU. Your splitter allows me to run two keyboards and mice. In addition, I have four monitors in the rooms that allow the patients to view their x-rays and treatment plans easily as well as me having private access to write my notes when needed. The installation was so easy that I completed it in less than one hour. Thank you again for your help and the excellent product that Network Technologies provides."